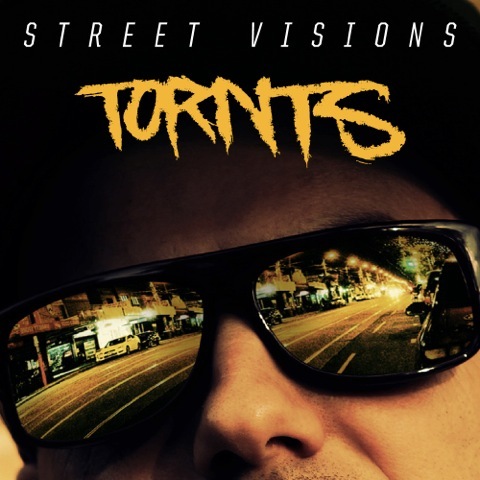 Melbourne rap heavyweight Tornts drops his latest release Street Visions. Its a highly evolved, focused and visual soundtrack to life in the city and it’s streets and characters. Full of life stories and descriptive rap narratives mixed over big world standard production Street Visions is the sixth studio album in Tornts highly respected catalogue of ground breaking releases. The lead single and video I Do This produced by Dutch producer Ciph Barker, is a highly personal track where Tornts writes of his own life and struggles as well as those of others. The listener can tell they are in for an album that stands out on it’s own in terms of it’s depth and descriptive wordplay over world class beats. The second single and video is the street anthem This Place produced by Tornts himself, features rising dancehall/reggae artist Apprentice. For the first time, hard hitting Melbourne street rap has combined with underground dancehall/reggae to produce outstanding & classic results. Tornts raps ‘We ain’t living on the beach in Home and Away, there’s poverty, homeless and strays‘ while Apprentice keeps up the relentless truth with a strong vocal style that hits the mark & stays on repeat in the listeners mind. Other standout tracks on the album include the hard hitting trap single Dirty Town which features Melbourne beatmaker Kharnivor on production. This introduces us to a world where ‘Lost memories, bottleshop key rings, Lacoste crocodiles snap in a sea of sin‘. Fellow HG crew member & crowd favourite Diem shares the spotlight on the captivating song Dark Days which contains an unmatched visual intensity that describes claustrophobic life in troubled times. Over a powerful, synth laden beat Tornts delivers visual lines ‘In the abyss watch the vertigo, tortured souls like Guantanamo, ordered cold, that’s the city bro, whore to hold, one fifty dough‘. Famed UK producer Beat Butcha (Lloyd Banks, Prodigy) helps to deliver the monstrous anthem ‘Life‘, which Tornts‘ aggressive yet steady flow is paired perfectly with. He also produced ‘Killin’ It‘ which sees BTE’s newest rising star Dr. Flea stepping up to the mic with Tornts. QLD dons Kings Konekted step up to smash guest verses on Out Here, rapping over slow Tornts melody driven trap production. The track is highly cinematic with lines by Tornts such as ‘Rough little Conans, hating their old man’s, and wishing for gold hands‘ setting up for an incredible track that showcases the standards that Street Visions has risen to. Tornts‘ crew, Hired Goons also feature on an epic banger called This Is HG cementing their status one of the most respected underground rap groups in the country. The album is brutally honest and as visual as a motion picture, standing out on its own with an international standard of production, highly original content and delivery that is indicative of Tornts‘ style. Street Visions is a definite evolution in his journey as an artist that’s never been afraid to speak the truth about his life and the darker sides of society, while pushing bound-aries with every release.